Copyright © Reed Business Information, a division of Reed Elsevier Inc. All rights reserved. --This text refers to the Paperback edition. Website: Danielle Trussoni includes information about her newest novel "Angelopolis"
Danielle Trussoni is the author of' "Falling Through the Earth: A Memoir," which was the recipient of the 2006 Michener-Copernicus Society of America Award, was a BookSense pick and was one of The New York Times Ten Best Books of 2006. Her first novel "Angelology" will be published in 30 countries. 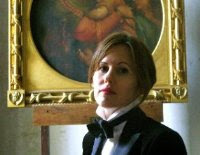 Danielle Trussoni is the author of the memoir Falling Through the Earth, which was selected as one of the Ten Best Books of 2006 by The New York Times Book Review. A graduate of the Iowa Writer’s Workshop, she lives in the United States and France. Trussoni’s first novel Angelology was inundated with rave reviews; the New York Times’ Janet Maslin called Angelology “a class-obsessed, scholarship-spouting, minutiae-strewn thrill ride that follows the “Da Vinci Code” model as loftily as it can.” Trussoni is planning a series and is already at work on a second book, Angelopolis. Variety reports that Columbia beat Universal in a million dollar auction for film rights to Angelology, which will be produced by Will Smith and James Lassiter’s company Overbrook Entertainment. A. I began to write Angelology with a very clear picture of the settings I wanted to include in the story. I knew that I wanted to write about a convent and I knew that I wanted to write about The Devil’s Throat, a cave in the Rhodopes Mountains of Bulgaria with an amazing waterfall and underground river that is now a UNESCO World Heritage site, but I wasn’t entirely sure of how to bring the material together. Knowing that I needed to have a firsthand encounter with convent life, I went to St. Rose Convent in La Crosse, Wisconsin (my hometown) to speak with the nuns who lived there. My great-aunt Drusilla is a Franciscan Sister of Perpetual Adoration living at St. Rose, and this made my presence at the convent a little less odd, although I’m sure that the nuns didn’t know what to think of having a writer trailing after them and asking personal questions! I came to the Orpheus myth in an equally roundabout fashion. The Devil’s Throat captured my imagination when I lived in Sofia, Bulgaria, with my husband, the writer Nikolai Grozni. He took me to the cave for the first time and I fell in love with the stark, craggy landscape and the mythologies that surrounded the cave. In local legend, the Devil’s Throat forms the entrance to the underworld where Orpheus descended to save his lover Eurydice. So my interest in Orpheus was really secondary to my interest in the cave itself, at least in the beginning. A. The process was completely different in some ways and very similar in others. My first book was a memoir about my relationship with my father and was, of course, much more personal in nature. I found that Falling Through the Earth was more emotionally draining, especially because my father was ill for much of the time I was writing the book. Angelology, on the other hand, was a pleasure to write. I had such fun creating the characters. I found that I deeply enjoyed going to my desk each morning because I would often discover something completely new about the story. By the end, I loved the characters I had created and didn’t want the project to end. A. Research was a huge element in preparing to write Angelology. I did not have much experience studying theology or the history of religion, and so I felt that it was absolutely necessary to learn as much as possible about the various perceptions of angels. I read a lot of wonderful academic studies about angels and I read quite a lot of the Bible. I read parts of Thomas Aquinas and St. Augustine and the history of religious orders in the United States. It was also very important for me to research the historical periods that appear in the novel—the medieval world of Brother Clematis, the Second World War environment of Celestine and Gabriella. I also made many trips to New York to capture Evangeline’s and Verlaine’s world. Q. Which did you enjoy writing more, the present-day events with Evangeline and Verlaine or Celestine’s narrative? A. Actually, the most engrossing section of Angelology for me to write was Brother Clematis’s narrative, a first-person journal of a monk’s journey to the Devil’s Throat. I also loved writing Celestine’s recollections of Paris in the 1940s. Both of these characters allowed me to imagine places and historical events that were very far from the life I was living when I wrote the book. Being transported to other places is, for me, is the real pleasure of writing fiction. Q. One of the novel’s conceits suggests that the divide between church and science was engineered by an outside agency. Do you think religion and science have become antagonistic? A. Yes, it seems to me that, in many ways, science and religion have parted ways. We don’t have many intellectuals like Isaac Newton who are dedicated to exploring both the divine and natural worlds at once. Our era is marked by the division of thought into specialized compartments—either one is a scientist or a historian or a mathematician or a philosopher or a doctor. Indeed, Newton—who was a physicist and an astronomer and a theologian among other things—would probably find our specialized approach to knowledge very strange. A. In Angelology, the characters posit the idea that the Nephilim are behind all great acts of evil throughout history—war, famine, genocide, and great economic inequality. The angelologists, who are at work to fight the Nephilim, believe that through wealth and influence the Nephilim have created systems—economic, political, social—that suppress regular people. Some of the characters in the novel believe that the Nephilim orchestrated the Nazi rise to power, but of course this speculation is part of the fictional world I’ve created. A. I have always loved the sense of dislocation I feel when I live abroad. I have lived in Japan, Bulgaria and now France. I find that I begin to pay very close attention to my own culture when I’m in a place that is entirely foreign, and that my attention to detail sharpens. The English language becomes very comforting, almost like a cocoon, after fumbling with a foreign language. In the end, it is nice to have the option to live far away from home but then, of course, it is great to come back, too. A. In a lot of ways living with another writer helps me to stay on course with my own work. We have a set schedule each day. Both Nikolai and I write in the morning in different offices at home. We work until around lunch, eat lunch together, and then either go back to writing or do the shopping or take a walk. Our morning work hours are very quiet, very calm, with no music or television on, making the house a perfect environment for writing. I am also able to discuss my work with Nikolai, which is unbelievably helpful. A. Evangeline is in quite a difficult situation at the end of Angelology and she will be working through the complications of this in the next book. A. I am writing about Evangeline, of course! The sequel to Angelology is set in Paris and finds Evangeline and Verlaine trying to find their way back to one another. This was a fabulous book! Mysterious and monumental in the telling of the legendary Nephilim of biblical times. I was completely mesmerized by it. Danielle Trussoni is a master storyteller. Imaginative does little to describe her talents. 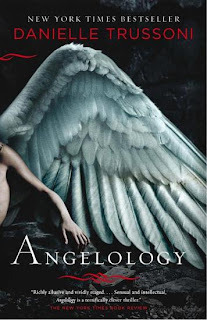 "Angelology" is a mystery and suspense novel that is unusual while it posits some interesting theories about earthbound angels spoken of in ancient times. The angel characters Ms Trussoni has created are glorious, dark creatures while they pass for beautiful humans. Charismatic and strong, they draw the average human to them, often with deadly results. As literary figures they are as monumental and captivating as Anne Rice's vampires. I fell in love with them...even the most evil of them! Evangeline, the "human" protagonist who grew up protected in the convent is a precious figure who becomes daring and dangerous as the novel progresses. I found this so compelling in the plot as it drove the action and kept me cheering her on. This is a startling novel unlike any I've ever read. It's rich in detail. Rich in gothic, descriptive surrounding and lush living. The angelic creations are gorgeous and inspired. Ms Trussoni is a wonderful author who has followed up "Angelology" with a new book, "Angelopolis" which I'll be reviewing in the coming week. It, too, is a blockbuster of a novel! I highly recommend this book as a great read and the first in Trussoni's series. You can grab it in paperback on the bookstands now. Everyone seems to love this book but I'm just not convinced it's for me. When I first heard about the book it sounded interesting—then again I heard too many people say this book is long and a drag, however, I'm still interested in checking it out. Let’s just hope it's named a NY Times Bestseller for a reason.